When a customer contacts your Help Desk with a service question or issue, you expect your Help Desk Agents to provide consistent, repeatable, and accurate solutions. If the needed service support information is scattered throughout your company, how can you expect your Help Desk Agents provide timely support? The 8 steps to mature a knowledge management system is the process of identifying, collecting, formatting, training, and using service support knowledge to resolve a customer’s service question or issue. Knowledge Management systems make service support information immediately available to your agents to answer the customer’s question or resolve their service issue on first contact. A robust and mature Knowledge Management System enables the Help Desk to deliver greater business value with more efficiency. We have outlined a process of starting or maturing a knowledge management system. It can be overwhelming starting or maturing a knowledge management system with the large number of company services your department supports. It is important to target your knowledge management improvement efforts to your highest priority services first. Create a list of all of the services you provide support for by talking to your staff, customers, management, and other key groups. Once you have a list of all of your services, create a column and assign a priority rating of high, medium, and low based on how critical the service is to your company’s business. Next create another column and assign a priority rating of high, medium, and low based on the monthly customer contacts for questions or issues related to each service. Start with the services on your list that have a high mission criticality and a high contact volume. Collect all of the support information you can find related to these services. Your can find support information with your staff, the application development teams, customers, and the Internet just to name a few. Save each solution to a document and store them into a folder for the particular service. There are many options for what repository to use for your knowledge management system solutions. The first option is to investigate if your Help Desk ticketing system has a module for knowledge management. Using the knowledge module in your Help Desk ticketing system is typically your best option. However if your system does not have a knowledge management module or the module will not work well for you, I suggest setting up a Wiki. A wiki is a web based service, which solutions can uploaded, edited, and removed. In a wiki you can create hyperlinks which will allow your Help Desk agents click between the support solution pages. You can host a wiki internally or find a vendor to host it externally. The most important attributes of the knowledge management repository you select is that the system presents solutions quickly to reduce customer delays and all of the content is full text indexed to allow Help Desk Agents to search by keywords as needed. A knowledge management system can quickly become blotted with excessive solutions, solution pages not following your standards, or have outdated and incorrect solutions if a role and responsibility structure is not defined. Also it is very important to open up solution review process to developers, business analysts, and escalation teams for expert review. We recommend the following knowledge management roles be defined. Knowledge Management process owner – This role is responsible for the knowledge management process. This includes knowledge management procedures, documentation, and rules. This person initiates or accepts process change requests, organizes group review of process change requests, implements process changes, and ensures communication occurs on process changes. Knowledge Management Administrator – Responsible for access control and the proper function of the knowledge management repository server and database. Editor – Responsible for final review, approval, and publishing of new or updated knowledge management solutions. Coordinates logical structure changes to the knowledge solution structure. Submitter – Gathers knowledge information and proposes new or updated knowledge solutions. User – Uses knowledge solutions to provide support to the customer. Once you have identified knowledge management services and collected knowledge management solutions, it is time to format your knowledge management structure. We suggest first creating a service home page template. A service home page is the top level support page for the specific service and identifies some or all of the following attributes of the service. 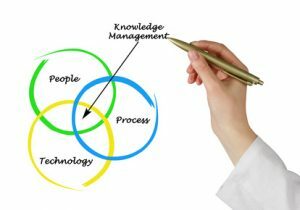 How to access the knowledge management system. How to submit a new or updated solution for review. At this point it is time to use your system in production. You might not have solutions entered for all services yet. However by starting with mission critical and high contact volume services, you will have the main services completed. Only by using the knowledge management system will you be able to identify issues. As you use your new system you will identify structure or solution updates that will be needed. If the Help Desk Agent is unable to answer a question or solve an issue they will escalate it to the next level of support. A good way to identify when solutions need to be updated is to monitor ticket escalations. Making sure the escalation groups provide good ticket notes or direct feedback on what they did to solve the issue is very important.